It’s always fun to find recipes with ironic and sometimes bizarre names. When we do, the backstory to the name is almost as intriguing as the recipe itself. Mizeria certainly counts as one of those recipes. When translating into English, mizeria can embody several concepts, none of which are at all flattering. Mizeria, the food, corresponds to the Polish word mizerny or quite literally “misery” in English. Other translations for mizerny include “poor” or “ill-looking” (this one was our favorite). But why is this? Why would a recipe, which we came to find as super delicious in its simplicity, be considered so miserable? And if it were really so miserable, how has mizeria stuck around as one of Poland’s most traditional recipes? The first (and seemingly most plausible) explanation comes from a former Polish Queen. As the new wife to recently widowed King Zygmunt, an Italian royal named Bona was displaced from her beloved Italy and brought to live in Poland. The transition from Renaissance Italy – then a leading culinary force with an abundance of fresh vegetables – into meat-and-millet-centric Polish cuisine proved to cause the Queen a bout or two or many of homesickness. Technically, cucumbers, which are the main ingredient in mizeria, aren’t part of this włoszczyzna classification, but they were one of the ingredients Queen Bona missed the most from her home country. And as legend would have it, it was eating this cucumber salad in particular that brought her the greatest homesickness and corresponding misery with her new living situation. Hence, it was the Queen’s misery that gave mizeria its branding. Whatever the real root cause for its unflattering name, mizeria is certainly anything but miserable. Truthfully, there is very little that goes into mizeria, which in turn makes it such an easy and quick recipe to prepare. 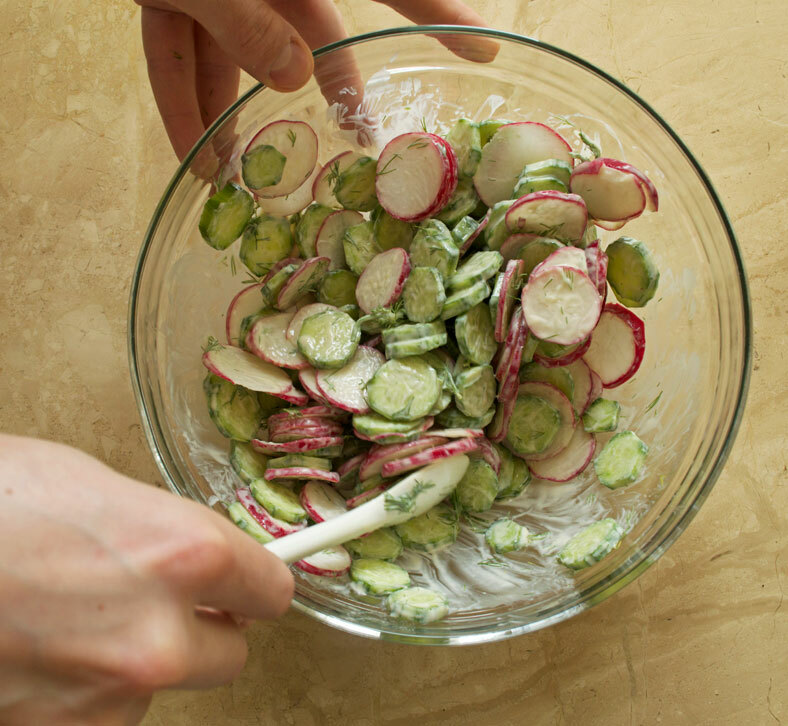 At the heart of the recipe are cucumbers. Most traditional and highly simple recipes will only have cucumbers in the recipe, although there are plenty of deviating recipes to the contrary as well. 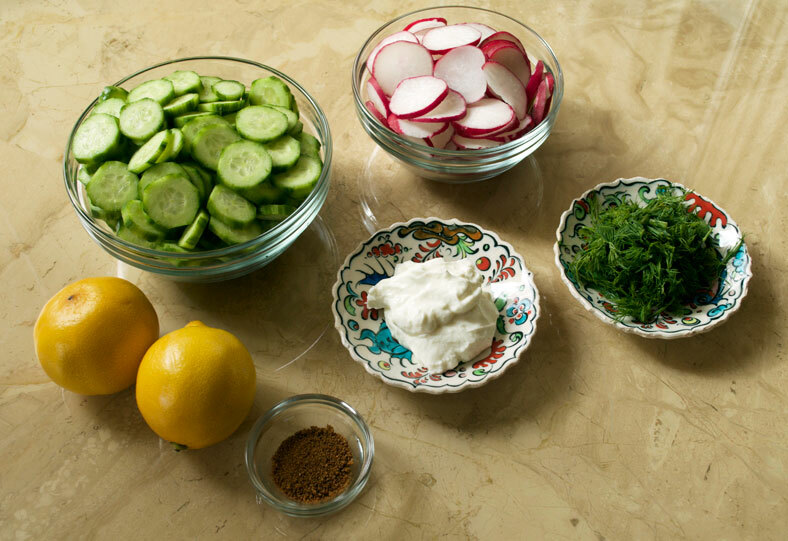 The cucumbers are then mixed into a dressing made of sour cream, onions, a bit of sugar and an acidic flavor like lemon juice or vinegar. 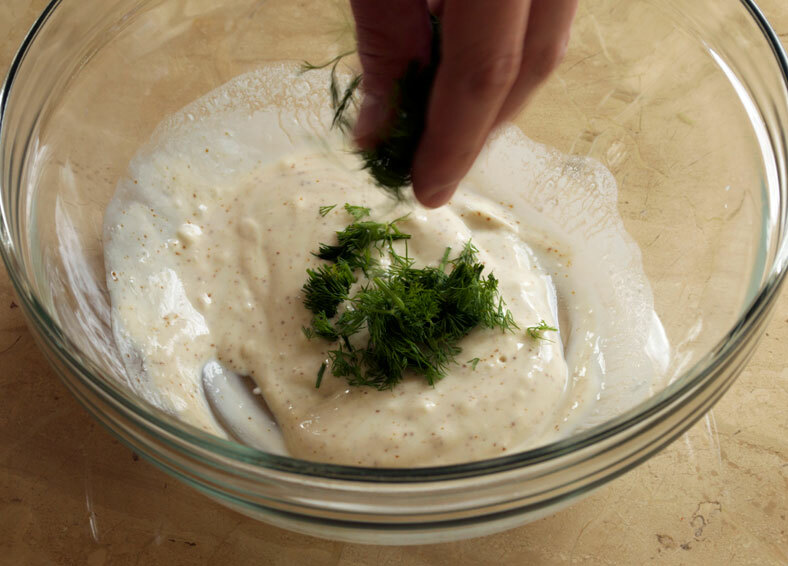 Depending on the recipe, additional herbs and seasonings like dill and black pepper might be added as well, but this will be always off of a base sour cream recipe. One of the unsung keys to the power of mizeria does lie in the tiny bit of sugar used. Especially when using sour cream or a plain-flavored yogurt alternative, the overall taste of the dressing can be fairly sour if it isn’t added. 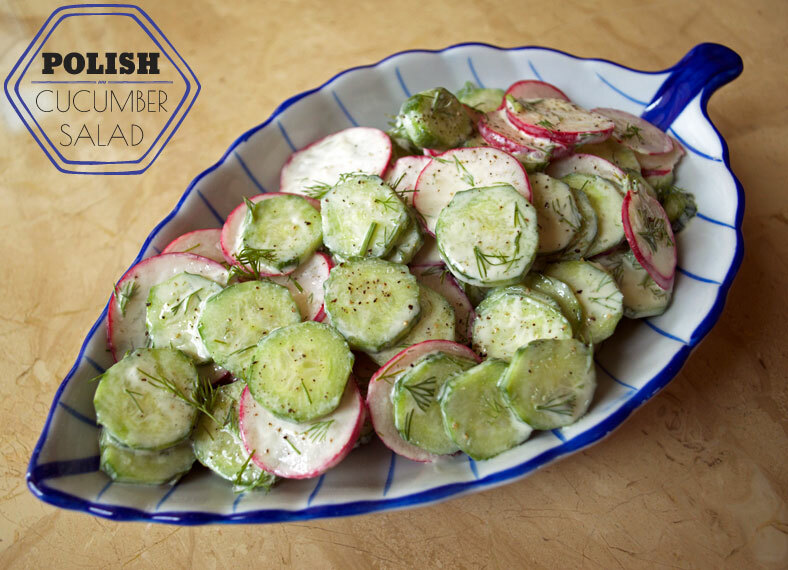 By adding the sugar, however, you end up with a harmonious sweet vs sour balance in the dressing, and a surprising freshness that brings out the flavor of the cucumber. Compiling all the ingredients together is an absolute cinch. It really is as easy as making your dressing, chopping the vegetables, and then combining them together in a bowl. Et voila, mizeria! Once it’s made, most recipes will suggest letting the ingredients sit together for a few hours to let the flavors marry together. Once ready, it’s a cooling and lighter compliment to just about anything, especially any heavier Polish fare you might enjoy. Given the utter simplicity of mizeria, there weren’t many adjustments at all we made to our original reference recipe. Instead of sour cream (or any type of cream for that matter), we did make a fairly large leap into using full-fat Greek yogurt instead. Especially if you find the right type, it is the healthier option, plus we’ve grown more fond of the thicker consistency and texture that Greek yogurt can offer. For sugar, as with most other recipes involving sugar, we substituted coconut sugar in place of any brown or granulated alternatives. It’s a little better, if only slightly, and does carry a distinctive taste to it. Of course we understand that it might seem a bit far-fetched to connect coconut sugar to Polish food, but it worked out surprisingly well. 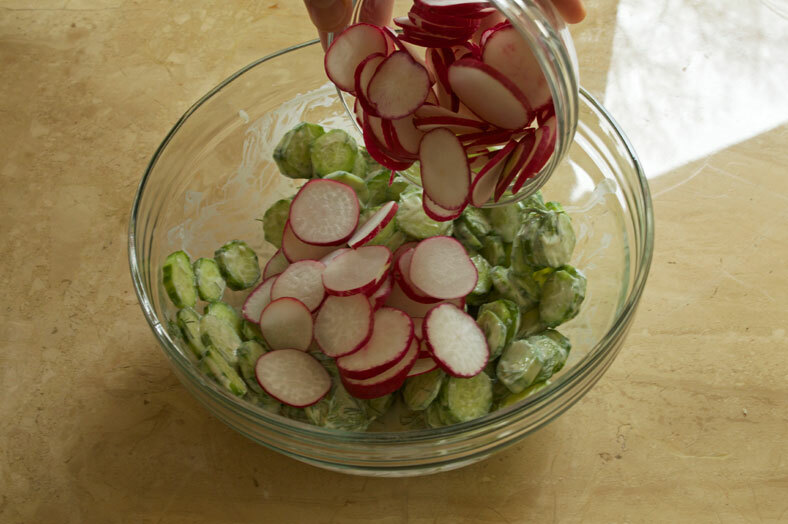 In terms of additional ingredients, one reason we chose Przepisy Aleksandry as our reference recipe is because of her inclusion of radishes into her salad. It’s not a traditional ingredient to mizeria by any means, but it adds a fantastic new dimension of taste and texture to the salad. We left it in our recipe for that very reason. Other than that, there is very little else that needs to be done to an already delicious and healthy recipe like this one. Whether as a side dish or even as a main course, it can substantially do the job as both contrary to popular belief. How do you make your mizeria? Comment below!